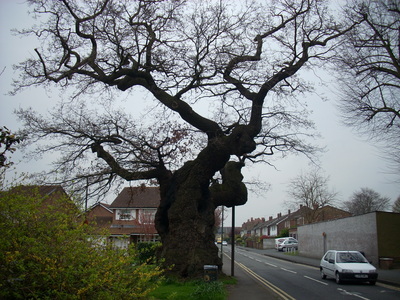 Our friend Tracy told us about “the Preaching Oak” in Addlestone. 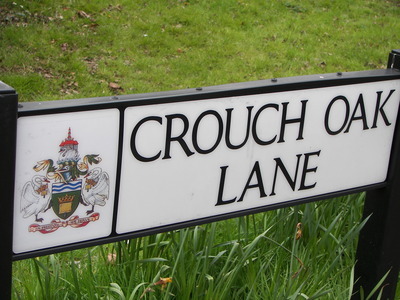 There are no signs marking this spot, other than the name of the street. This oak tree was a gathering spot. At least three preachers used this oak as a gathering place to preach. Did you catch those names? John Wycliffe, John Knox and Charles Spurgeon? I still get tingly thinking about it. The post on the left is supporting this ancient tree. which were zipping by, we imagined a meeting by the oak. 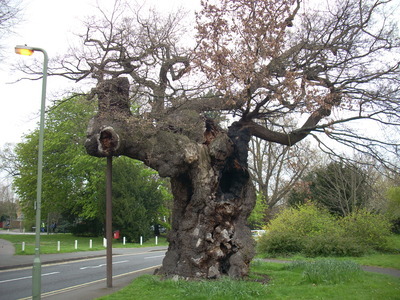 By this oak, in the fourteenth century! 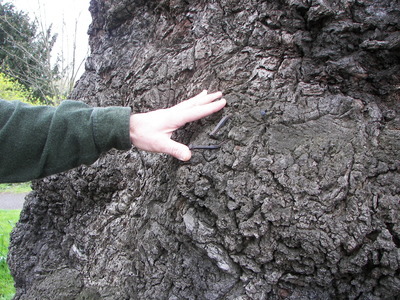 Curt found square nails in two separate places on the tree. and the preacher stood on the platform above the people. @hiddenart – Oh, Oh! As a teenager I read those books – who was the author? Eugenia…yes, Eugenia Price. I’m not sure I would like them now, but they imprinted St. Simon’s Island on my heart.Thank so much for all of your comments, Dana. Carol, thank you for all these beautiful travelogues. And this last one is especially meaningful. Spurgeon too? He is my favorite devotional writer – Morning by Morning is a daily ritual for me. Oh I felt like I was there with you, touching the tree, breathing the air and imagining those clear unaided voices crying out. Oh for such voices today! Thank you for this. I felt like we peeked into history. We once stood in Oxford where the marytrs of the reformation were burned. Also holy ground. blessings and love in SC. Wow! 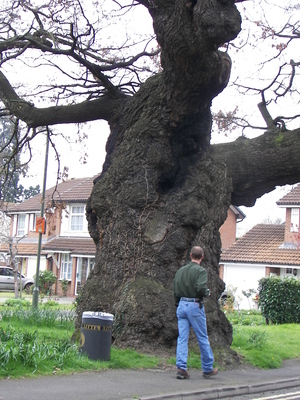 Magnificent tree, magnificent history. That is something I haven’t gotten over, the antiquities that are scattered all over Europe and commonplace there, people still live in 700 year old houses, they still grow and eat the same kinds of food their ancestors did and call then the same names; Neeps, Tatties. . . It just blows my mind! In the States, we be more apt to knock those 700 year old building down and put up a mall! eek!